Ask students which animals they know come from eggs. After students have brainstormed animals that they know hatch from eggs, present a chart with three columns (yes, no, maybe) and pictures of a variety of animals. Let students take turns choosing an animal picture card and orally stating the animal's name. Let students decide if each animal definitely comes from an egg or definitely does not hatch form eggs. Let students share how they know this information. Place all other animal picture cards in the 'maybe' column on the chart. ; Explain that all this week, we will read books to find out about which animals actually do hatch from eggs and which ones do not. Share that as we learn new information, the class will need to move some of the animals from the 'maybe' column to one of the other columns. 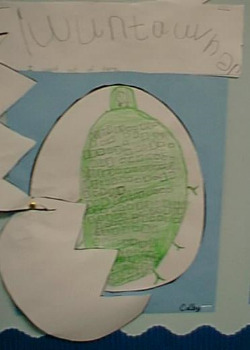 Introduce title, author and illustrator of this week's focus story It Started as an Egg;Show the cover and talk about what type of egg is shown. What animal might hatch from this egg? ; Take a picture walk letting students name and describe the baby and adult animal in each picture. What is the name of this animal? Is it called the same thing once it is an adult? How has the animal changed as it grew into an adult? ; Read aloud for enjoyment. ; Refer students attention back to the prediction chart. Are there any animals under the 'maybe' column that we now know hatch from an egg? Refer to the prediction chart and the focus story in order to review with students what they learned about animals that hatch from eggs; Reread It Started as an Egg. How can we tell that the chick and the duckling are friends? How did the duckling help his friend? What might the chick and duckling have learned by the end of the story? Do you think it is all right for friends to do and like different things sometimes? Why or why not? Share a time when you and a friend did different things. Introduce the pocket chart story with pictures (duck only at this time) and words. Discuss with students what they see the duck doing in each of the pictures. Show students the pictures of what the chick is doing, but out of sequence. Ask students to place the pictures in order, alongside the corresponding pictures of the duckling; Read the story chart with students. Companion Rhyme: Introduce the companion poem 'Peck, Peck, Peck' by Aileen Fisher and read aloud. Focus Story: Shared Reading - Reread It Started as an Egg. Shared Reading - Reread The Chick and the Duckling using the pocket chart story and pictures; Have students mask letters such as d, e, m, t, s, etc. Also have them locate sight words such as the, am, I, etc. Reread the companion poem 'Peck, Peck, Peck'. Let students name the rhyming words; Reread - choral reading (half the class, every other line); As yesterday, change the name and picture of the animal from a 'chick' to another oviparous animal. Do this several times, letting students choose the animal. Reread together. Together, reread It Started as an Egg; Introduce the take home booklet in which there are pictures of animals that hatch from eggs. Students need to complete the booklet, by writing the missing letters of the names of the animals. Read together with students tracking the print in their individual booklet. It started as an egg. It hatched and it grew. Companion Story: Shared Reading - Reread The Chick and the Duckling using the pocket chart story and pictures. 1) Set up 'Egg Stations' for exploring the space, weight, and area of an egg.